What happens when the political ideas and constitutional interpretations of one generation are replaced by those of another? This process has occurred throughout American history down to the present day as "we the people" change our minds about how we govern ourselves. Depicting a monumental clash of generations, Gerard Magliocca reminds us once again how our Constitution remains a living document. 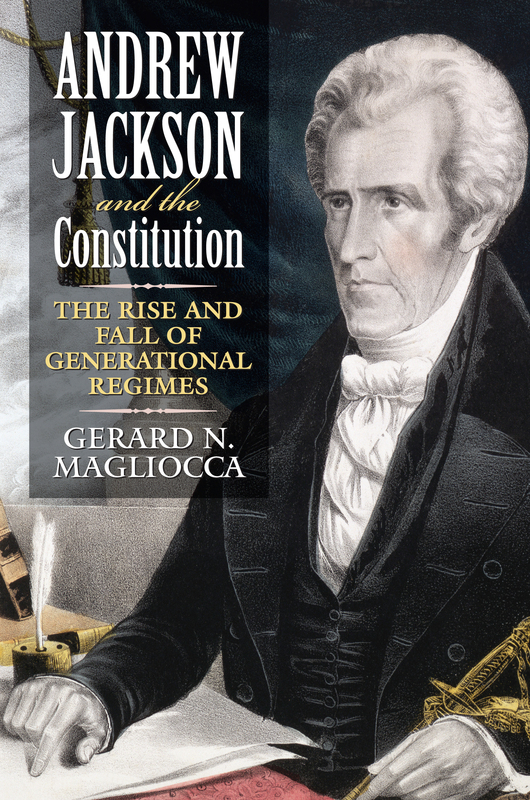 Magliocca reinterprets the legal landmarks of the Jacksonian era to demonstrate how the meaning of the Constitution evolves in a cyclical and predictable fashion. He highlights the ideological battles fought by Jacksonian Democrats against Federalists and Republicans over states' rights, presidential authority, the scope of federal power, and other issues. By doing so he shows how presidential politics, Supreme Court decisions, and congressional maneuverings interweave, creating a recurrent pattern of constitutional change. Magliocca builds on the view that major changes in American political and constitutional development occur generationally—in roughly thirty-year intervals—and move from dominant regime to the emergence of a counter-regime. Focusing on a period largely neglected in studies of such change, he offers a lucid introduction to the political and legal history of the antebellum era while tracing Jackson's remarkable consolidation of power in the executive branch. The Jacksonian movement grew out of discontent over the growth of federal power and the protection given Native Americans at the expense of frontier whites, and Magliocca considers such issues to support his argument. He examines Jackson's defeat of the Bank of the United States, shows how his clash with the Marshall Court over the Cherokee "problem" in Worcester v. Georgia sparked the revival of abolitionist culture and foreshadowed the Fourteenth Amendment, and also offers a new look at Dred Scott, M'Culloch v. Maryland, judicial review, and presidential vetoes. His analysis shows how the interaction of reformers and conservatives drives change and how rough-and-tumble politics shapes our Republic more than the creativity of judicial decisions. Offering intriguing parallels between Jackson and George W. Bush regarding the scope of executive power, Magliocca has produced a rich synthesis of history, political science, and law that revives our understanding of an entire era and its controversies, while providing a model of constitutional law applicable to any period. Gerard N. Magliocca is associate professor of law at Indiana University-Indianapolis.